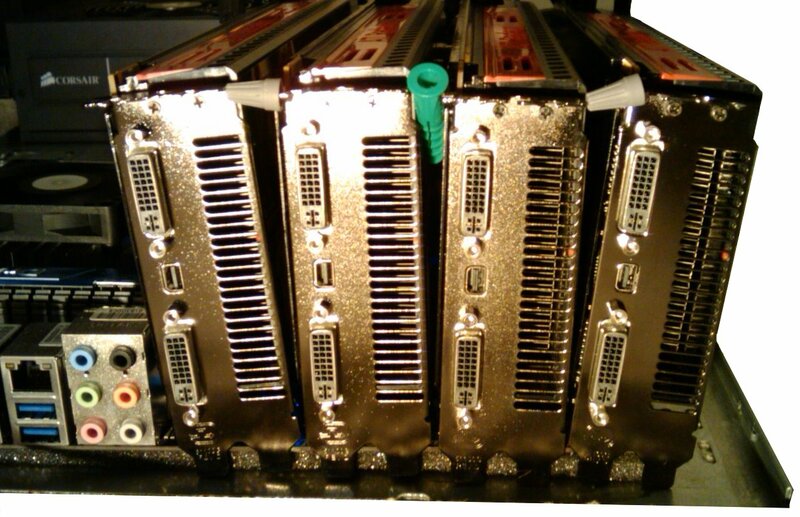 I am asked sometimes why I used a cheap $60 motherboard with PCIe x1 slots and four $30 flexible PCIe x1 extenders to build this 4 x AMD Radeon HD 5970 graphics card machine, when I could buy a motherboard with four x16 slots and not need any extender for the same price. As I said in that post, and as I showed in pictures, this makes cooling easy as the ~2cm gap between each card dramatically helps with cooling. Without this gap, full loads on the cards raise GPU temperatures to 95-100°C within minutes, at which point GPU clocks start being throttled, degrading performance. Lay a motherboard with four x16 slots flat (horizontal) in a rackable chassis, or on a rack shelf. Plug the four HD 5970 cards in. Do not screw them into the chassis. Obtain some plastic elements the size of pen caps, or wire nuts. Insert them between the cards. The mechanical imprecisions of PCIe slots allow ~1cm gaps to open between the top edges of each card. Use the undocumented, reverse-engineered Linux "aticonfig --pplib-cmd" PowerPlay interface to manually set the graphics card fan speeds to 70% or higher. Make sure to maintain ambient room temperature below 30°C or so. Voilà! Enjoy running GPGPU apps on this easy-to-build hardware beast (no watercooling!) with no fear of overheating. Wire nuts are convenient to use in my experience for creating the gaps, as they lock securely in place on the card brackets, as shown in the picture. $ env DISPLAY=:0.0 aticonfig --pplib-cmd "set fanspeed 0 70"
$ env DISPLAY=:0.0 aticonfig --pplib-cmd "get fanspeed 0"
I have been stress-testing this cooling hack on a 4 x HD 5970 machine based on the MSI 890FXA-GD70 motherboard in harsh conditions —25°C ambient— for multiple days, and the GPU temperatures have been holding quite fine in the 65-90°C range. 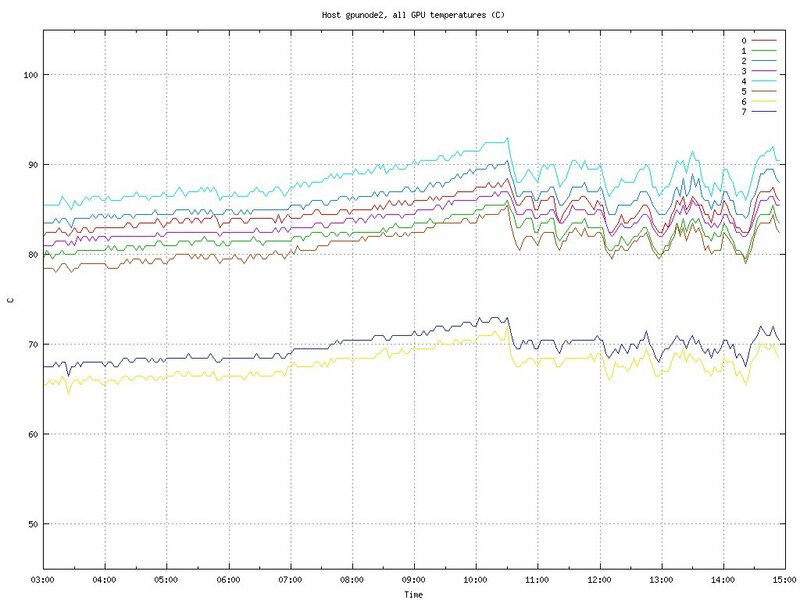 The graph hereafter shows temperatures for each of the 8 GPUs at 100% load over a 12-hour period. GPUs #6 and #7 correspond to the rightmost dual-GPU card (in the picture) whose fan is the only one not obstructed by another card, which is why they have significantly lower temperatures. I have made the same as you with windows but when I open the cgminer only uses one GPU and it hashes at 690mhz my question is how do you make the 4 cards work as one?